_________________________________________________________________________________ Which do you like better Enderman? or Zombie? Put your answer down and why you think that. zombies. i like them both but zombies are just cooler. btw y did u show beta endermen and giant zombie? yes I know but what do you like better? Zombie or enderman? So you like zombies better? He said once. When Endermen were first introduced, they could take away anything. Once a enderman picked up one of my diamond blocks it was scary but it put it back down and then I ask my cousin if he had seen a enderman and he said it picked up his wolf!!!!!!! It gives you food poisoning though. 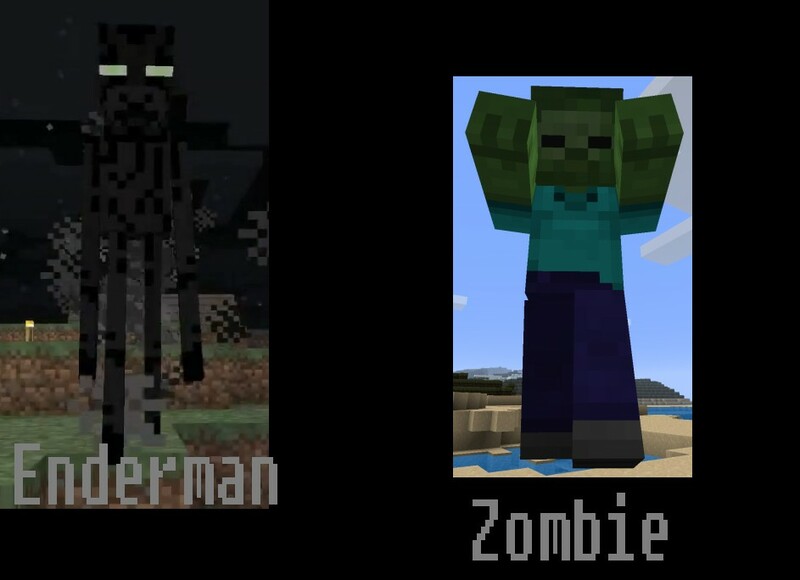 They may be really anoying and look a bit retared but they are still better then zombies.And by the way how do you insert images in comments.Then I can show you why Enderman isnt my favourite mob. Probably the zombie as the Enderman isn't done yet, as in it hasn't got its own sound effects yet, it's just taken the zombies'. That is true, the sound is not cool, the same appends with doors and chests, having the same sound gets confusing when others ppl are near you using those.